Advanced Sheetmetal Technologies (AST) has given the smaller fabricators in Australia and New Zealand a new manual folding technology that draws on various characteristic, that until now had only been found on automated units. Particularly suited to the small company that cannot justify the expense of electric and computerised machinery or for those working predominantly with standard blank sheets, small quantities or once-off projects, the Schroeder Model ASK folding press is the cost effective performance solution which AST carries in stock. Key to the performance of the ASK is a completely manual system of segmented tooling; a simple pick and swap block system that allows intricate bends not just on standard flat blank sheet, but also on those with complicated bends on corners and edges. AST says the development of this Schroeder unit will increase the amount of companies that can facilitate more complicated jobs, but without the expense of automation. These are manual, hand operated folding machines that draw on certain technologies which until now has been the sole preserve of automated folders and benders. 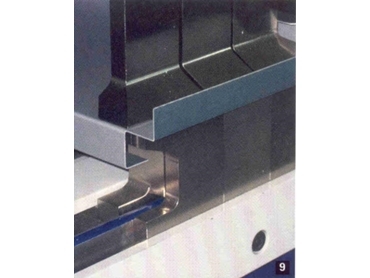 A principal aspect of folding machines is that the most technological, computerised panel folders with complex tooling systems, such as horn tools and goats foot tooling had evolved from the simple manual pan folder. Now Schroeder has reversed the development process and adapted aspects of the tooling technology from high-end automation that can adapt to these completely manual folding/bending machines. The overall result is a much wider scope for complicated edge work and bend intricacy on the once humble hand-operated folding machine. The Schroeder ASK has a multistage drive of the upper beam, which allows the use of tools with different job heights. A clever, yet simple, segmented tooling system for upper beam, lower beam and bending beam allows tremendous clearance for bending extreme profiles. Its interchangeable toolbox operates on a simple clamping system, which requires just a short movement of the hand for a tool changeover. The time for a tool change is virtually zero, while the clamping power is high and bending precision exceptionally good. The ASKII version has all these functions but can work on higher capacities. The upper beam is changeable, which allows the standard ASK unit to be extended with the fast clamping system. ASKII has a display for bending angle, and backgauge arms that offer a support for the sheet and fix it with fingerstops in the right position. It has clearance in all dimensions, and with the inclusion of a foot pedal the operator's hands are freed up for work. Also included is a dynamic counterbalancing with gas pressure springs, and all guides and machine elements are maintenance- and wear-free. In Australia and New Zealand, everyone knows AST as the company supplying computerised equipment for Sheetmetal processing and jobbing shops. But now AST also have agency agreements for some good manual jobbing machines that will allow the smaller and less complicated jobbing shops to take a step towards better automation without the expense of electric power and computerisation.